Some important voices are hard to hear. They might be quiet, confusing, weak, or deceptively ordinary. They might be hard to hear because they speak truths that are painful or messy or threaten our comfort zone or hit a nerve we have been numbing. They might say things we know are true but have turned into items on a self-improvement to-do list we’re currently avoiding. They might say things that seem too big to face. Last summer, I got an email from a woman I know peripherally – like me, she’s a tenor saxophonist here in NYC – announcing the formation of an advocacy group for women in jazz, and inviting me to join. I skimmed the email with a feeling of vague irritation, marked it unread, and let it sink into the shallow grave that is page two of my inbox. Yup. That would be the author of the buried email. But I was there to write music, to get away from the my normal life and the normal world with all its loud demands, the shouting voices demanding I justify my existence according to the terms of capitalism and adequate woke-ness and the canon of music history and innovation and just the right balance of ambition and cool. Wow, a chick playing saxophone, that’s hot! But, how do you make your living? So, I did not want to read that email, I did not want to spend my time at this retreat complaining about The Patriarchy, jazz or otherwise… or so I thought. At this residency, we spent most time on our own, working, but we came together every evening for a meal, and we often lingered, talking into the evening. Six people – at first strangers, and then friends, and then almost like family – at dinner together every night for a month. There were four women, including me, whose ages coincidentally represented each decade from 30s through 60s, a gay man in his 50s, and a straight man in his 70s who we’ll call George. You know George. We all know George. George talked a lot. Loudly. Frequently over and through other people. While the other artists treated me as a peer despite our age difference, George told me, wow, he could be my grandfather. (But, like, a grandfather who still made some questionable comments about my appearance.) George is a non-fiction writer, and he just didn’t seem to “get” art: he was always trying to justify or reduce his own work and our work to measurable terms of the market. George was more or less an embodiment of the things I was at the residency to avoid. He was, like the Man, man. Naturally, I want to stick it to the man. But in that scenario, when I most want to prove myself as a capable individual, everything freezes. There is this opaque, dense, hot feeling in my chest… my vision goes blank. My words stick. The loudness of the imagined argument between that guy who, explicitly or implicitly, says that I can’t do it or I’m not welcome because I’m a woman and the “me” who wants to prove that women can be anything (even saxophonists!) is so loud that it overwhelms the the “me” who wants to learn/grow/make mistakes/recover/follow my curiosity and, like, make music! I recently learned that this phenomenon has a name: stereotype threat. Stereotype threat – that unique form of choking that proves you are exactly the thing you’re trying to prove you’re not. For example, In a Stanford study, a situation was designed to activate a negative stereotype about scholastic ability; the African-American students underperformed. When the same test was done without activating the stereotype, the African American students performed up to their abilities. When I feel like I’m carrying the weight of my entire gender’s reputation on my back, the load is too heavy to bear. Stereotype threat makes quote-unquote “small” acts of sexual harassment that much more impacting, because they inflame the imagined, internal provoker – they are evidence for the truth of the loud argument that is overshadowing the quieter self. When I thought about George I had that feeling. A crushing feeling that I guess we can call also call dread: a chronic warning. On guard because my boundaries are being tested, and there’s no way to know if George’s similarities to dangerous men in my past are real or imagined. I played past incidents over in my mind, and I felt powerless. I should have been stronger: I should have reported, I should have quit, I should have yelled. As the residency progressed, I started to lock my door. I began to have dreams about George: George had a knife to my throat – he was taking away my voice. But surely I was being paranoid! Over-reacting. Why was I letting this guy bother me so much? Why did I have to be so sensitive all the time? I felt those things, but I still didn’t know what I was listening for. Then, it was October, I was back home, and people were tweeting #MeToo. And I was listening. Listening to women speak despite the twitter trolls, to hear those thousands of small voices clearly telling the truth. You can comment all day til dark. You can call me any name you want. You can look me up and down. I won’t stop, no, I won’t fall apart. That’s the truth, and it’s one I needed to hear. I needed to know I wasn’t alone and that I wouldn’t fall apart. I was listening to other women describe things that have happened to me, but which I hadn’t wanted to name. Wanted to ignore because I didn’t want to be the kind of weak or sensitive person – weak and sensitive woman – who would be affected by something like that. I was listening to other women describe how they hadn’t reported, hadn’t quit, hadn’t yelled. And I understood that I was not alone. I didn’t want to admit that part of me is invested in the status quo, the kind of manipulative power that women are supposed to settle for, along with the way my whiteness and accent and education give me access and perks and safety… Saftey that is contingent on following the Man’s conditions. And they come at much too high a cost. The many stories of women, the voices of truth were pointing back to the reality that our workplaces, schools, streets, and churches need to change. We can’t build our world on the Man’s terms any more. In the same way that it took me a while to wake up to the truth that was being spoken, Samuel starts out confused, too. God speaks to Samuel with such an ordinary voice that it takes him a while to realize the magnitude of the situation. Let’s get a bit of backstory of Samuel. Samuel is the son of Hannah. Hannah could not have children, but prayed and promised God that if she could finally conceive after so many years of being unable, she would give her child to God as a nazirite consecrated to the service of God. Samuel is that miracle baby, who is raised in the Temple serving the priest Eli. Eli’s own sons, priests themselves, were no. good. They were eating the sacrificial meat – even insisting that people bring it raw so they could cook it to their taste – and, proving that workplace sexual harassment is hardly new, “they lay with the women who served at the entrance to the tent of meeting.” Eli is warned, but he can’t seem to stop his sons. But the truth is, God has a better world in store for Israel than one with priests like those sons of Eli. That is what Hannah trusted in when she gave her son Samuel to God. Hannah was willing to give up even the thing she prayed for because she had such faith in God to provide a different future, a future beyond the constraints she currently felt. The pillars of the earth are the Lord’s. But Israel says we don’t care we just want to be NORMAL. Luckily, God knows how to get our attention, and God doesn’t stop trying. Hannah’s song foreshadows another song in the Bible, sung by the mother of another, even more miraculous son. Mary, mother of Jesus, sings a very similar song which has become known as the Magnificat. The mighty will fall, the small shall be raised. And that song announces Jesus as a new kind of king who’s supposed to get us out of the earthly king business forever. How can we listen to Jesus’ voice? Prayer transforms our dread and our numbness and our pain in a way which can be uncomfortable and even scary, but is revealing, and healing. Repenting – loosing the hold of the world’s flaws – converts listening to allow for the truth to be heard. In case you were wondering: remember that email? I replied, I joined. I am listening, and I am praying. Asking God to look where I’m afraid to look. Asking God to be with me while I dare to turn and face what’s been following just behind my peripheral vision. Listening to the quiet voices I’m prone to dismiss. Prayer is a revolutionary matter because once you begin, you put your entire life in the balance. If you really set about praying, that is, truly enter into the reality of the unseen, you must realize that you are daring to express a most fundamental criticism, a criticism which many are waiting for, but which will be too much for many others. When you pray, you open yourself to the influence of the Power which has revealed itself as Love. At St. Lydia’s this season we take time after the sermon to reflect and confess. We’ll write our confessions, and hang them from the branches above. I invite you to reflect on this question: Where do you have selective hearing around a small voice, inside or outside yourself? 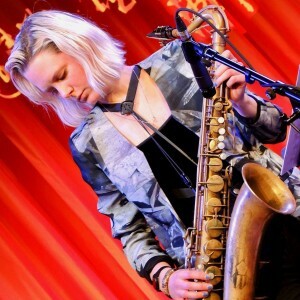 Angela Morris is a saxophonist-composer and other things in Brooklyn via Toronto. Her performance schedule and recordings can be found at angelamorrismusic.com. At St. Lydia’s, Angela coordinates music and liturgy, and curates a monthly experimental performance series called Brackish. Le Tigre. “On Guard.” Feminist Sweeptakes, Mr. Lady, 2001. Nouwen, Henri J.M. With Open Hands. Ave Maria Press 1972.